The absurd notion that I’m biased against fathers - Putting right this misconception. 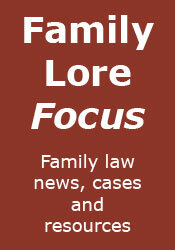 Lessons for family litigants from a neighbour dispute - As in Dickinson & Anor v Cassillas. Is the concern about the new divorce form a storm in a teacup? - The real reason why more adulterers may be named. Bias against fathers: exercising my right to reply - Putting right further misconceptions.